Reprodicimos en su integridad el artículo en inglés escrito por nuestro colaborador Jonathan Luna de Polinizaciones. A small path descends from the town of La Jagua, crossing a field and forest until it ends at a cliff overlooking the Magdalena River. Pairs of buff-necked ibis take flight announcing their local name, “cocli cocli.” Above the beach where children swim, the rock is carved by erosion and dotted with small holes occupied by birds. The landscape is dotted, too, every 100 meters, with concrete markers declaring the land, river, and everything else a “public utility” that Colombia has given to the energy company Emgesa as part of the Quimbo Hydroelectric Project. Quimbo’s developer, Bogotá-based Emgesa S.A. Empresa Generadora de Energía, projects costs at $700 million for the hydro component and $200 million for substations. The Ministry of Environment granted a construction permit in May, and the dam is scheduled for full operation by 2014. 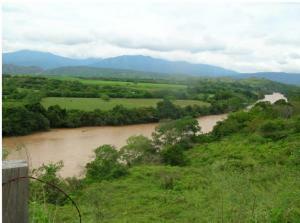 “If completed, it would be the first of multiple Emgesa dams proposed for the river in the department of Huila, along the country’s longest and most economically important river,” said Miller Dussán, a leader of the grassroots coalition Plataforma Sur de Organizaciones Sociales and professor of philosophy at the Universidad Sur Colombiana (USCO). Discussion has been heated on radio and in the Colombian legislature which, in November 2008, held a televised nine-hour debate. Endangered Huila communities have mounted opposition marches, camps, and local and regional social forums. Plataforma Sur is spearheading the effort, which includes regional youth, USCO academics, the Regional Council of Indigenous Peoples of Huila, Colombia’s largest labor union (CUT), various social and environmental NGOs, autonomous collectives, and politicians including a former governor of Huila. The campaign is part of REDLAR, the Latin American Network against Dams. Emgesa is part of a tangle of energy companies that service large swaths of Europe and South America. In 1997 Emgesa had merged with Colombia’s Betania to become the country’s number one electricity producer. By 2007 it was generating 11,930 GWh of electricity or 22.4 percent of the country’s electricity output, according to its website. Emgesa itself is a subsidiary of Endesa- Empresa Nacional de Electricidad S.A., a Spanish energy giant specializing in natural gas and hydroelectric dams. Endesa S.A. is Spain’s largest hydropower generator and Latin America’s largest private power producer, serving 23 million customers in Argentina, Chile, Colombia, Peru and Brazil. In February, Enel SpA, Italy’s biggest utility, bid $14.3 billion and succeeded in buying out 25 percent of Endesa from Spanish builder Acciona S.A., boosting its stake to 92 percent. Enel SpA’s acquisition would “help the Italian utility to expand in South America, where economies are growing,” according to Bloomberg News. Emgesa, the profitable Colombian subsidiary of Endesa, has drawn accusations of labor rights violations and environmentally destructive practices. In July 2008, it was among the 43 companies that the Colombian Session of the Peoples’ Permanent Tribunal accused of bad business practices and involvement in the country’s armed conflict. The tribunal charged Endesa-Emgesa with “violating the labor and union rights of its workers to freely associate, for infringing on the norms of industrial security and for the environmental deterioration of the River Bogotá, the River Guarinó and others.” Emgesa, like most of the accused companies, ignored invitations to participate in the proceedings. Emgesa’s dam project also threatens traditional Huilense culture, critics charge. Before the European invasion, la Jagua on the Magdalena River was a ceremonial center for indigenous groups. The arrival of the Spanish sparked a 500-year struggle for survival. In the 1530s, when General Pedro de Añasco beheaded a traditional leader, he set off an uprising. La Gaitana, the assassinated leader’s mother, led 15,000 warriors, many of them women, to force the Spanish out for several years. In a later attack, Gaitana escaped by diving into the river from the cliffs of Pericongo Canyon, a proposed dam site. While some descendants survive, the most evident vestiges of the advanced societies that once inhabited this region are the archeological remains in areas including San José de Isnos, another proposed dam site. Current residents are mostly campesinos of mixed indigenous and Spanish descent who cultivate cocoa, tobacco, corn, banana, passion fruit and rice. The river system threatened by the dam irrigates their crops, supplies fish, and provides them work as day-laborers and fishermen. It is also rich in exotic and endangered flora and fauna. In 1997, when Emgesa first presented plans for the Quimbo dam, the Ministry of the Environment denied the project because “none of the remediation plans presented in the environmental impact study were viable.” By May 2009, after scores of protests, the license granted Emgesa included social and environmental mitigations expected of the company. In the televised debate in the Colombian legislature, the local non-profit Autonomous Environmental Corporation of the Upper Magdalena River Valley and opposition senators showed that utilities revenues would recoup the initial $700 million investment for the main dam in about 12 years. For the remaining 38 years of the dam’s life expectancy, Emgesa would generate $26 million, of which a mere $6.22 million will be reinvested locally, in a single payment. While the youth hiked, members of la Escalereta community and the Plataforma Sur met in Bogotá with Emgesa representatives, the governor of Huila, and Uribe. The president called the dam a “done deal” because Colombia cannot afford to “lose the faith of foreign investors.” Quimbo is integrated into the multi-billion dollar Project Mesoamerica (formerly Plan Puebla Panamá) and the Initiative for the Regional Integration of South America (IIRSA). The “Quimbo and the other dam projects that are part of Plan 2019/Visión Colombia are important energy generation projects in the country,” said Emgesa representative Montero. Some critics suspect that the government is using protests over the dam to militarize the territory and suppress opposition. Currently riot police—ESMAD units—are being placed in the region’s larger cities, and a new army battalion is being built in La Jagua. Asked about the militarization, Montero replied that Emgesa “respected the government’s actions,” and was not the proper entity to respond to the government’s decision to construct a battalion near the end of the reservoir. • Compensate people such as fishermen and truckers whose life-sustaining activities are disrupted. • Invest 6 percent of annual profits into the regional environmental corporations and municipalities. While the terms are a substantial victory for the dam’s opposition, the Ministry document failed to deal with previous fines against the company or the project’s fundamental violation of Law 2 of 1959 which designates 95 percent of the dam’s region as part of a Protective Amazonian Forest Reserve. Those omissions fueled charges that either the company, the state, or both had bought off the Autonomous Environmental Corporation of the Upper Magdalena River Valley that is now on board with the project. On June 5, International Environment Day, two dozen youth occupied and halted a meeting of the Departmental Gathering of NGOs and Community Environmental Promoters that convened in Neiva to showcase government-sponsored environmental projects in the region. The vice-minister of the Environment, the director of Autonomous Environmental Corporation, and hundreds of people watched as protesters performed an interpretive dance and read a declaration against the dam. Three days later, Plataforma Sur issued a resolution denouncing the project's assaults against the region’s biodiversity, communities and existing legislation, and demanded that the license be revoked. On June 23, a paramilitary group identified as the Nueva Generación de Águilas Negras circulated pamphlets on Neiva's USCO campus targeting 14 members of Plataforma Sur. It identified students, alumni and faculty as “military objectives." Despite the threat, activists are planning an international camp against the dam in November. Bogotá and Emgesa promote the dam as “necessary” to an area long forgotten by the state: It will, they say, create jobs and development opportunities in aquaculture, tourism, irrigation and construction. An alternative plan, el Quimbo Huilense—designed and backed by communities, academics, educators, and other Huilense people—counters that the best path for sustainable development is a widely integrated, multi-faceted rural development project. This regional scheme would create opportunities for local inhabitants to establish small-scale agricultural cooperative industries, and create protected habitats, irrigation districts and more agricultural land. Quimbo Huilense addresses energy needs with a smaller hydroelectric dam at the Quimbo site that would inundate 3,600 ha, affecting only the municipality of Gigante. A local utilities company would run the project, and provide irrigation for 148,262 hectares. In its reliance on community input to create a self-reliant local economy with sustainable environmental practices, Quimbo Huilense stands in direct contrast to the government and Emgesa’s plans for the region. Last week a message came from CCP about introducing micropayements to Eve online. First thing that ought to be available for sale is skill remap. Eve online is an excellent game as it is. Single server, about 35 thousand people online, hundreds of people fighting with each other in attempts to create little space empires. When I heard about this initiative I was shocked. Players already pay a monthly fee for playing this game. Now they want to introduce privileges for those who can spend extra euro for the game? A decent system already exists which allows those with extra money to legally buy ISK eve currency. This system works fine for quite some time now and is one of the best ideas implemented by CCP. But micropayements are too much. By looking at all other games that decided to go with micropayements you will notice that all of those MMOs balance is now messed up. at the begging there are unimportant things but the demand for more powerful merchandise quickly spins the system out of control. Players with to much real money get great advantage over those who cant afford to spend more than the monthly fee.